When patients do an IVF cycle, the onlything really care about is the outcome – they just want a baby ! If life wereperfect , then every time the patient had a perfect IVF cycle , she would get pregnant . Unfortunately, human reproduction is not an efficient enterprise, and the outcome of an IVF cycle is always uncertain. This is becausebiological processes cannot always be influenced by the doctor and we have verylittle control over what will happen to the embryo after we transfer it intothe uterus. The sad reality is that we cannot manipulate the process of implantationThis is not something which must patients want to hear . It's anuncomfortable feeling knowing that no matter what you do, you can never be surewhat the result of the IVF cycle will be – each IVF cycle is effectively agamble , which you may have to repeat multiple times , until you achieve success. 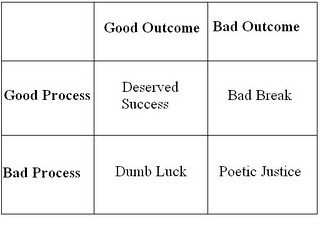 This is why it's important to differentiatebetween processes and outcomes . While outcomes cannot be controlled , theprocess itself can be, and a good IVF clinic will follow good processes. Now iflife were always, fair good process would always lead to good outcomes, so thateveryone's happy. Unfortunately, good processes can lead to bad outcomes , andan IVF cycle can fail because of circumstances which are beyond the doctor'scontrol. While mature patients understand this ,most patients are not sophisticated enough to appreciate this, and if the IVFcycle fails , they are understandably upset and frustrated . They will oftenvent their anger on the doctor , complain about his clinic, and even write bad online reviews that he's incompetent andhas not done a good job , even though the process he followed may have been perfect. Conversely, we do have bad IVF clinics , where patients do get pregnant, inspite of the fact that they follow bad processes . This is just plain dumb luck- and is particularly common in very busy clinics who will do lots of IVFcycles for young patients who don't even need IVF in the first place ! Theseclinics will obviously have a high success rate , as a result of which their reputationin the community will spread , because patients are not sophisticated enough tounderstand that the good outcome was not a result of good processes, butbecause of smart patient selection ! As a result, some of these doctors continueto fool some of the patients some of the time . Finally you have clinics which followbad processes and therefore have bad outcomes. These will shut down in a fewyears – but only after having caused a lot of harm ! When a cycle fails, most patients cannotdifferentiate whether the bad outcome was because the doctor followed bad processes, or whether it was a result of plain bad luck, even though the processes werefollowed perfectly. Unfortunately manyIVF doctors are not transparent ; and few patients are willing to invest thetime and energy in order to understand the process which were used.Consequently, many clinics get away with fooling their patients , bypreying on their ignorance . Just like it's important for a good doctorto follow good processes it's equally important for a patient to become a goodpatient and do their homework , so they understand the difference between goodprocessed and bad processes, no matter what the outcome !